Birders and wildlife enthusiasts on Ireland’s East Coast (counties Louth, Meath, Dublin and Wicklow) and County Wexford can now receive free news of rare bird sightings direct to their mobile phones. The services have been set up by birder, wildlife photographer and co-author of “Shorebirds of Ireland” Mark Carmody using the social networking website Twitter. He’s hoping to make up-to-the minute details of rare bird sightings available to local birders, as well as informing them of national rarities when something really unusual turns up. 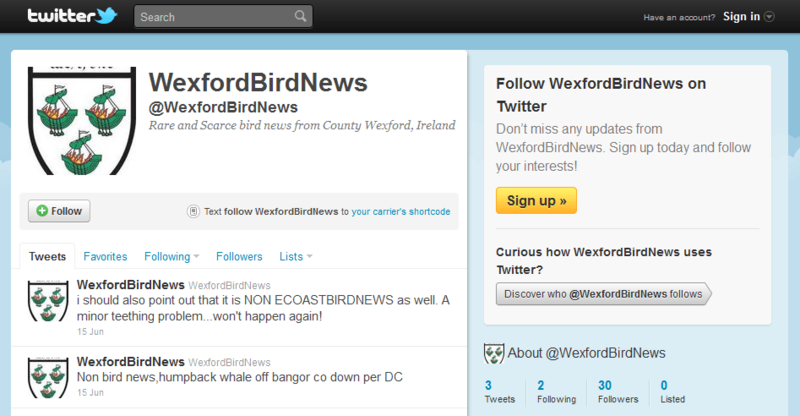 To get updates on the web all you need to do is go to the relevant twitter profile in your browser (www.twitter.com/ECoastBirdNews for the east coast updates and www.twitter.com/WexfordBirdNews for Wexford updates) – you don’t even need a twitter account to access the information via the web. To get updates in the field via your mobile phone you’ll need a Twitter account (you can sign up for free on www.twitter.com). Once you have an account all you have to do is follow @ECoastBirdNews and @WexfordBirdNews on Twitter, and set your Twitter account to send you mobile updates from selected accounts, you’ll start getting the latest news for free on your phone. Birders in Co. Cork have been enjoying similar up-to-the-minute rare bird news since March 2010, when West Cork birder and environmental consultant Colin Barton launched @CorkBirdNews, harnessing Twitter’s burgeoning potential to keep Cork birders informed. Don’t forget you can follow Ireland’s Wildlife on Twitter too!